to better coordinate technical efforts among a rapidly growing group of UNAVCO technical centers and facilities. a broadening and decentralization of the UNAVCO technical facilities, which, over the course of the next year, are expected to include: the data acquisition, and data management and archiving groups at the UNAVCO Boulder Facility; the data archive/orbit facility at Scrips/UCCSD; a proposed data analysis facility based at MIT; a data recovery group based at UT Austin/Univ. of Miami; a proposed antenna research group based at Harvard/Smithsonian; and growing links with the GPS technical group at NASA's Jet Propulsion Lab. a gradual expansion of the number of federal scientific agencies supporting GPS science, making it an auspicious time to broaden the definition of the UNAVCO Consortium. U.timately, with additional institutional support, UNAVCO technical support may extend to scientific projects independent of the sponsoring agency. Efforts are underway to seek support from USGS and other interested federal agencies. panel reviews of the UNAVCO Facility Proposal to NSF that were generally critical of the lack of scientific coordination among UNAVCO-supported research projects, and some that were critical of fundamental weaknesses in the approach to GPS scientific data collection and analysis. Discussions at the UNAVCO Steering Committee meetings (held in Boulder, February 6-7) centered on developing new mechanisms to stimulate communication and coordination among the growing GPS science community, and to facilitate stronger interaction between the providers and consumers of GPS technical services. The group recognized that UNAVCO, unlike other scientific consortia (RIDGE, IRIS, etc. ), was developed to take advantage of a particular technology, rather than focusing on a particular scientific problem. As a result, it has lacked a strong science-based organizational structure to meet the scientific and technical interests related to GPS science. Within this broadly defined consortium, the present 'UNAVCO Facility' becomes only one of a number of technical facilities, in support of a closely knit community of GPS scientists. Because this proposal would represent a fundamental restructuring of the Consortium, we anticipate some period of community discussion, followed by a formal proposal to modify the Consortium's bylaws. The proposed reorganization of the UNAVCO's Consortium illustrated in Figure E-1 would encompass components of the existing structure, with a number of significant additions. Most notably, we propose to add: a UANVCO Science Coordinator whose primary function would be to stimulate, strengthen, and coordinate the science emerging from the UANVCO community. 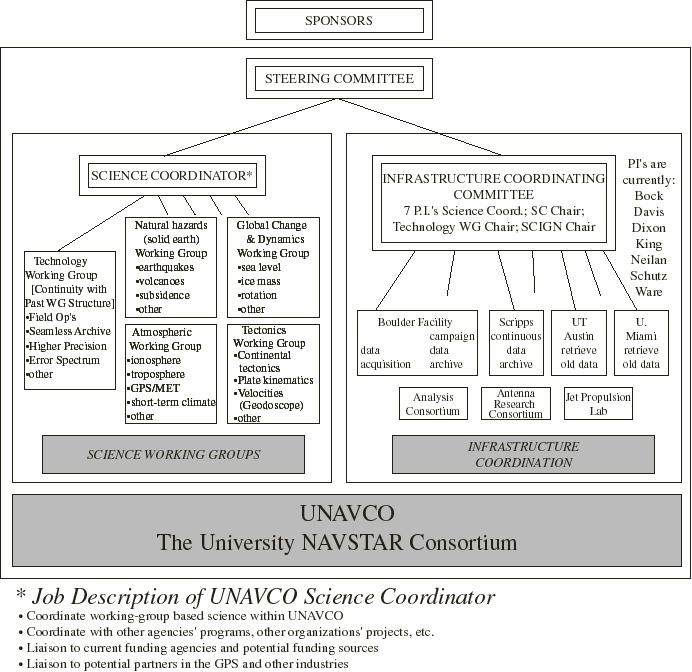 In addition five Science Working Groups whose mission is to define critical scientific problems in a number of broad research areas, and an Infrastructure Coordinating Committee, whose primary task would be coordination of the technical efforts of the seven UNAVCO-supported facilities would be created. UNAVCO Steering Committee: The Steering Committee would be composed of seven voting members elected form e UANVCO community, plus three ex-officio members, the Science Coordinator, a representative from NSF, and one from nASA/JPL. The Steering Committee would have responsibility for setting policy for the Consortium, selection of the Science Coordinator, and appointment of the scientific and technical working groups. Procedures for election of Steering Committee members would follow the present format. Individual Steering Committee members will serve as points-of-contact for the scientific working groups. to organize an annual UNAVCO-sponsored GPS science workshop. The Science Coordinator will initially be scoped as a half-time position appointed for three-year term. The position would be based at the Coordinator's home institution (similar to the RIDGE and SCEC offices), with supporting facilities (secretarial staff, travel funds, etc.) to be provided by the Consortium. Tectonics Working Group: address issues of regional and global plate kinematics, continental dynamics, and defining regional velocity fields ("Geodoscope"). Technology Working Group: incorporating the efforts of the present technical working groups, would address technical issues related to data acquisition, archiving, and analysis. This group would be closely linked to the "Infrastructure Coordinating Committee" (see below), in order to ensure that the facility is effectively meeting the scientific needs of the community. Working GRoup members would serve on a volunteer basis, and would be selected by the Science Coordinator, in consultation with the Steering Committee. We anticipate that the Working Groups would meet at least twice annually, once at a UNAVCO-sponsored GPS science workshop, and once at a national scientific meeting (e.g., Fall AGU or NASA meetings). Infrastructure Coordinating Committee. The proposed Infrastructure Coordinating Committee would consist of the ~7 directors/PIs of the participating UNAVCO technical facilities (i.e., (a) Boulder Facility for data acquisition/data archiving; (b) Scripps/UCSD archive/orbit facility; (c) MIT data analysis facility; (d) UT Austin and (e) Univ. of Miami data recovery facilities; (f) Harvard/Smithsonian antenna research facility; and (g) the GPS technology group at NASA's Jet Propulsion Lab). In addition, the Science Coordinator and the Steering Committee chair would serve on the committee, in order to ensure coordination with the scientific working groups and other community needs. This committee would ensure close coordination between the science goals of the community and the services and capabilities of the facilities. Figure E-1. Proposed reorganization of the UNAVCO's Consortium.